Are Decofresh, Whitonir, Germs – be – gone, and Con – cor familiar products? 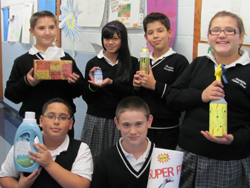 You won’t find them in your local stores, but you can find prototypes of them in Ms Makar’s Sixth Grade Class as part of their Language Art’s project featuring television commercials. The introduction to this project started with the class watching a video of an HBO special called Buy Me That. They saw how advertisers used slogans, music, and visuals to sell their products. The project itself consisted of a sample of their product, a poster, and an oral presentation. They used persuasive wording to try to convince the rest of us that their product was better than the competition. Maybe you won’t find SAMBAM, OLEX – IT, Head & Shoulders-Knees and Toes now, but maybe someday in the future you just might actually see one of these products on a store shelf. 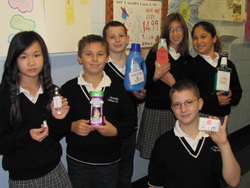 Just remember where the inventor got their start – right here at Assumption Catholic School.